Feeding therapy could involve oral-motor therapy to address weak musculature in and around your child’s mouth. It could involve a behavioral feeding plan with no oral-motor therapy. It could also be some combination of the two. Feeding disorders can be serious so if you are concerned about your child’s eating/feeding you need to contact a feeding specialistimmediately. Children with physiological feeding issuesmay have difficulty moving food around in their mouth, chewing and swallowing. Some babies may have difficulty with breast or bottle feeding and some are okay until the introduction of solid foods. Some red flags to look out for include difficulty transitioning to solid foods, coughing, gagging and/or vomiting. All of these symptoms can also be related to an underlying medical condition. Proper evaluation by a team of professionals is essential in determining the root of the feeding issues. 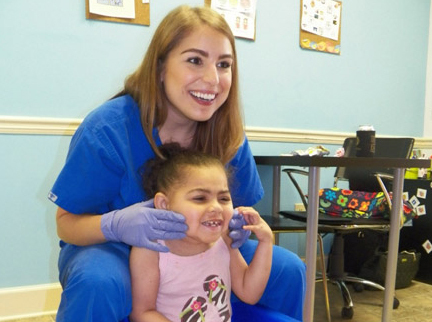 Feeding therapymay involve direct oral-motor intervention to address weak musculature in and around a child’s mouth or it may involve a behavioral feeding plan with no hands-on oral-motor therapy. **Feeding issues can be serious. It is important that you seek guidance from a qualifiedfeeding therapist if you are concerned about your child’s feeding development.